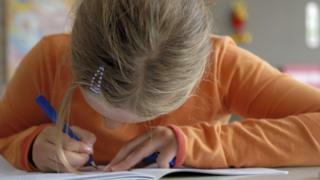 Nearly 90% of 10- and 11-year old pupils in England feel pressure to do well in tests, a survey suggests. ComRes researchers for BBC Newsround interviewed 750 10- and 11-year-olds who will be taking Key Stage Two Sats tests this week. The government says the tests need not be stressful and rigorous testing helps raise standards in schools. and 16% said it affected their sleep. But 32% said they worried more about schoolwork when they had tests coming up and 25% said they found it hard to concentrate. Last Tuesday some parents kept their children off school in a day of protest about primary tests in England - and more than 40,000 signed a petition calling for a boycott. The protest, organised by the Let Our Kids Be Kids campaign, complained of a damaging culture of over-testing, saying children are "over-tested, over-worked and in a school system that places more importance on test results and league tables than children's happiness and joy of learning". They raised concerns about the impact of primary tests, so-called Sats tests, taken by seven-year-olds and 11-year-olds, which are being made more stretching with changes to the curriculum. Natasha Devon, the government's former mental health champion for schools, whose job was axed last week, has also emphasised the level of mental strain being put on pupils by rigorous testing. A Department for Education spokesman said the tests should not be stressful "and we know that good schools manage them appropriately". The spokesman said that tests at the end of primary school "help teachers understand how pupils are doing and identify where additional support is needed, as well as helping us make sure schools are doing well. "They are a key part of making sure young people master the skills they need to reach their potential and succeed in life. "As a government we recently asked young people what we could do to help them support their friends better. More than 1,700 young people gave their views and we will be investing £1.5m in peer support based on what they have told us. "We have also worked with NHS England to trial a scheme to establish single points of contact for schools to make mental health support more joined up and readily available when it's needed."